Fears of a world awash in debt are widespread today. Fear of debt is a sign that investors aren't taking excessive risks. Stocks are in a good position ahead of the latest earnings season. A dominant theme on Wall Street in the years since the credit crisis has been the obsession with debt. Specifically, there has been a perpetual fear among analysts, investors and reporters that there is “too much debt” in the private and public sectors. Even in Washington, there has been a notable increase in the number of policymakers fixated on debt levels. In today’s report, I’ll make the case that widespread antipathy toward debt reveals a cautious, conservative mindset among investors. This, in turn, implies the financial market is on a sound footing and that risks are well-contained. Scarcely a day passes without a reminder from the media that there is a widely held, almost hysterical, fear of debt among the public. Since it was a surfeit of debt which fueled the 2008 market crash, this aversion to debt is understandable. From an investor sentiment standpoint, this fear of debt is quite instructive. The fact that the financial media still considers the concept of excessive debt to be worth mentioning in the headlines is also refreshing, for it tells us that there is virtually none of the careless risk-taking today which characterized the market prior to the 2008 collapse. A further illustration of the nation’s debt phobia can be seen in the recent attempts of even U.S. lawmakers to weigh in on the perceived problem. Virginia Senator Tim Kaine introduced a bill in Congress last month to address what some are calling a national debt “crisis” with the intention of preventing future fights over the U.S. debt ceiling. It goes without saying that the fear of a world awash in debt is commonly embraced by millions today. It has been precisely this fear which has kept many individuals from participating one of the longest bull markets on record. The narrative which many commentators are now spinning is that working-class Americans are loading up on debt and that another credit crunch may soon occur. However, this opinion doesn’t stand up to close scrutiny. As it turns out, millions of Americans have been getting their balance sheets in order over the past decade. 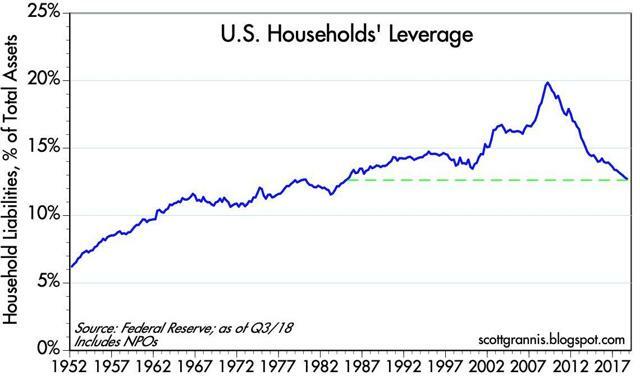 Below is a graph from the St. Louis Fed which shows the downward trajectory of household debt to GDP for the U.S. As you can see, household debt has been in decline since peaking around the time of the credit crisis. Another chart which highlights the dramatic reduction in private sector debt is shown below. This one is from Scott Grannis’ economic blog, and it shows a huge reversal in U.S. household debt loads in the past several years. Remarkably, current debt levels are now back to the levels last seen in the mid-1980s. With private sector debt levels waning, individuals are in much better shape financially today compared to 10 years ago. What’s more, participation in the equity market among retail investors is significantly lower today compared to the years prior to the 2008 crisis. For instance, stock ownership among Americans fell from a high of 65% in 2007 to a low of 52% as recently as 2016. 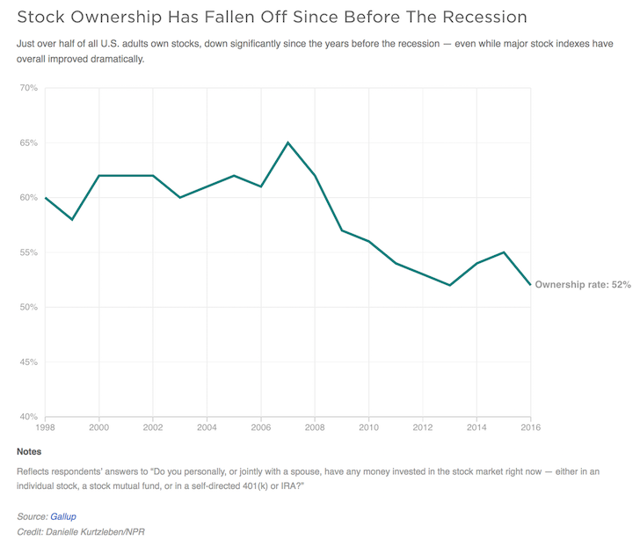 As of 2018, the stock ownership rate was still only 55%, according to Gallup. This is hardly the backdrop one would expect to see if there was a debt crisis brewing right now. The fear of debt and apathy toward equities that is so prevalent today is a sign that the bull market’s “wall of worry” is in excellent shape. As I’ve noted in past commentaries, this proverbial “wall” is what every bull market needs to climb in order to remain alive. A healthy amount of fear and skepticism among investors is a sign that equities aren’t overbought and that short interest levels are likely high enough to fuel future market rallies. This is the milieu we find ourselves in today, an environment in which fear abounds and people are afraid to take risks. This is precisely the climate that every long-term investor needs in order to prosper. Turning our attention to the near-term outlook, the stock market has embraced a “wait-and-see” attitude ahead of the latest earnings season. As several potentially market-moving corporate earnings results will be released, the major indices have mostly treaded water in the past few days. Increased volatility can always be expected at the front end of the earnings season, and the S&P 500 Index (SPX) may well pull back next week to test its 15-day moving average (below) before its next attempted rally. But my expectation for the SPX to overcome its September 2018 high by the time Q1 earnings have all been released remains unchanged. Supporting this outlook is the continued internal strength reflected in the 52-week NYSE new highs and lows. On most days this month, the new high/low ratio has been anywhere from 7:1 to 15:1 in favor of new highs. That’s a sign that the incremental demand for equities is very healthy. Meanwhile, the daily number of stocks making new 52-week lows has been well below 40 this month, which tells us that internal selling pressure is currently non-existent. This supports a bullish outlook for stocks. The only major area in need of improvement, short term, is in the Nasdaq. While certain segments of the Nasdaq (most notably the semiconductors) have been outperforming lately, the overall tech sector has experienced a minor case of “indigestion” recently. 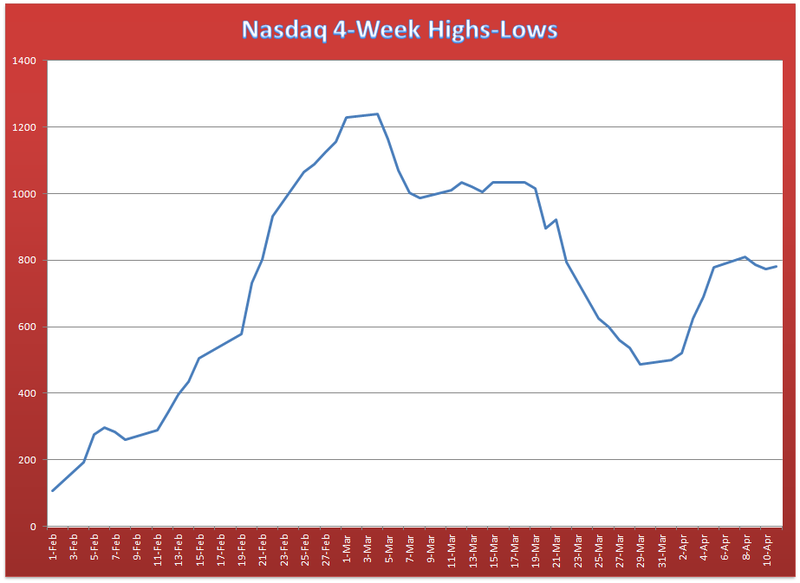 This can be seen in the following graph, which shows the 4-week rate of change in the Nasdaq 52-week new highs and lows. As the above graph shows, the short-term rate of change (momentum) in the Nasdaq based on the cumulative highs and lows is well below its early March high as of April 11. Thus, the recent rally in the Nasdaq Composite Index is technically unconfirmed by the new highs-lows. This shouldn’t be interpreted as an excuse to sell Nasdaq stocks, but rather as a caution signal. It means that until the new highs-lows momentum in the tech sector improves, conservative investors should hold off on initiating new long positions in Nasdaq stocks. Despite the relative internal weakness in the Nasdaq, the NYSE stock market outlook is still bright. Earnings expectations have been set so low by Wall Street analysts for Q1 that it should be very easy for earnings to surprise on the upside. With internal momentum on the NYSE still trending higher, stocks have a rising path of least resistance and should encounter little trouble in responding to positive earnings news. 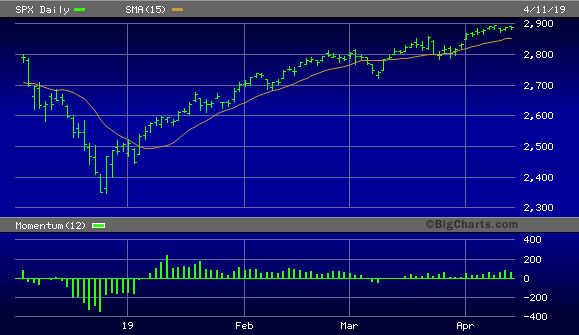 I expect the SPX to continue its recovery in the coming weeks and eventually make a new high this spring. From a sentiment standpoint, with fear and skepticism abounding, investors are also justified in maintaining a bullish bias. On a strategic note, traders can maintain a long position in my favorite market-tracking ETF, the Invesco S&P 500 Quality ETF (SPHQ). I suggest raising the stop-loss to slightly under the $31.50 level for this ETF trading position on an intraday basis. Only if this level is violated will I move to a cash position in my short-term trading portfolio. Meanwhile, investors can maintain longer-term positions in fundamental sound stocks in the top-performing real estate, consumer staples, and healthcare sectors.